Letter from John Richard Fountain to Margaret (Fountain) Acey, his daughter, 27 January 1967. This letter was written shortly before he died on 27 February 1967.
and the Fountain family through this link and this link. Some argue that famous people give up a right to privacy, and their papers are fair game. But, many people don’t become famous until years after their death, and it’s the writing they leave behind that makes them famous. What about the not-so-famous everyday folk like our ancestors? Do they have more rights to privacy than public figures? And what about the deceased: Do dead people a right to privacy? I know that I delighted when my “Auntie Edith” shared her stories of my mum, grandparents, great grandparents and other extended family. After all, I only knew most of them through the dry statistics of vital records, census records and related. You can share in her stories in “A Window of Memories” which is a compilation of stories which she shared with me and gave me permission to reproduce. I added some family photos from my collection to supplement what she provided. As the commercial often says … these stores are “priceless” to me. They give me such a sense of the “people” behind the statistics. They are my heritage! I literally own only three pieces of family correspondence that I inherited. A letter from my grandad to my mom soon after she moved from the UK to the US, a letter from my grandmother letting my mom know of her grandmother’s death, and the letter pictured from my grandfather to his daughter just a month before he died. Just sitting here typing, tears come to my eyes over the power of those letters, almost 50 years after they were written. I do a lot of research at Wilson Library (UNC, Chapel Hill) and I have spent hours pouring over personal correspondence and diaries of just “every day” people. These are not famous people, in the sense that we usually define such, and yet their incredibly personal papers give me such insight into their lives and the time periods in which they live. I am glad that such papers were not destroyed nor lost through time. That said, I am very cautious with what I share from such correspondence, diaries or related. We do have a responsibility to the deceased authors. That said, just as we need to be respectful of family correspondence that we have inherited, we also need to be mindful of what we leave behind for others to read. If there are letters you’ve written or received that you do not want others to access or you have concerns that the content will not be dealt with sensitively by your descendants, they are something you need to deal with NOW! I kind of view it like Facebook – only post what you are willing to share with the world. The same kind of thinking applies to what you place in a “memory box” – only keep what you are willing to have your descendants share with the world. What personal family correspondence has either provided you with invaluable genealogical clues or made you feel personally connected to an ancestor? Have you had to deal with an ancestor’s correspondence that was of a sensitive nature? How did you do so? What are your rules in terms of sharing family correspondence? Digital Estate Planning Laws -- Relevant to Preserving "Your" Digital Genealogy Assets! Though we do often talk of taxes as invaluable records, this post addresses the concept of death and whether or not you have addressed what becomes of your social media accounts, emails, cloud-based content, ebooks, digital music, web-based family trees, DNA test results, and much more? Let’s face it – we will all die and we do want to ensure that all that we’ve accumulated digitally will survive us and be available to our descendants. The Uniform Law Commission is tracking the implementation of the Fiduciary Access to Digital Assets Act, Revised (2015) which shows the 19 states which have enacted such legislation and 12 additional states which have introduced the legislation. This act extends the traditional power of a fiduciary to manage tangible property to include management of a person’s digital assets. The act allows fiduciaries to manage digital property like computer files, web domains, and virtual currency, but restricts a fiduciary’s access to electronic communications such as email, text messages, and social media accounts unless the original user consented in a will, trust, power of attorney, or other record. Check the applicable laws for the state in which you live. You might need to provide explicit instructions in your will. Many often provide their usernames and passwords to loved ones in advance to provide unfettered access. Again, check the applicable laws for the state in which you live and the user agreements of the relevant service providers. You’d hate to see your hard genealogical work “frozen” in a form of legal limbo. Plan now for the inevitable! What steps have you taken to ensure that your family history research related files are properly managed upon your death? Does Your Historic House Hold Family Secrets? Late last year we blogged about Though not common -- rare documentary treasures are found in unexpected places. I was again reminded of this when I read Who hid Patton papers in historic house 100 years ago? ASHEVILLE - The Patton-Parker House has stood at Charlotte and Chestnut streets since 1868, home to seven generations of one of Asheville's leading families. Little did attorney Jim Siemens know that when he bought the landmark last fall, the house still held secrets from 100 years ago. What an incredible find! It just goes to show that some houses (or other buildings) do have “secrets” actually physically hidden on the premises. As genealogists, our interest would be in discovered family papers, ledgers, photos and other materials to help discover more about our ancestors. Has a renovation project led to a neat discovery? What documents have you or someone you know uncovered in a building? What valuables have you or someone you know found hidden in a building? Created by Josh Hallett, https://www.flickr.com/photos/hyku/368912557/. Privacy! We all have different thresholds on this topic. Some people do not post any information anywhere and others invite you right into their daily lives. As genealogists we want to share information. As genealogists we have a duty to share accurate information. As genealogists we also have a RESPONSIBILITY to preserve the privacy of others, who are either directly or indirectly impacted by the information to be revealed. 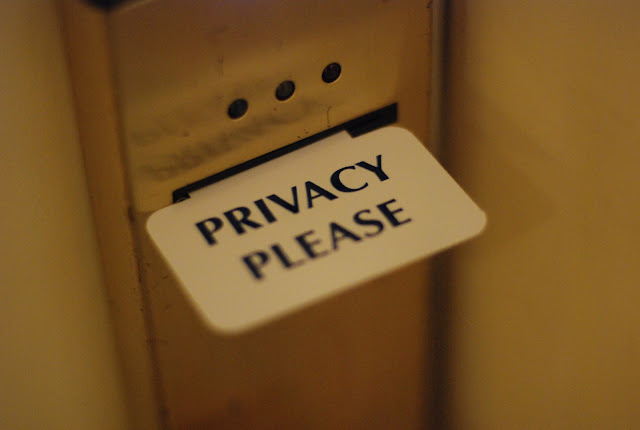 I was reminded of this when I read To Write or Not to Write: Respecting Privacy in Family-History Storytelling (posted on the Genealogy Insider blog). Our stories are not just our stories, they are stories that involve our family and other families. We do and did not live in isolation on an island by ourselves. Though we are the star of our own story, there are others involved every step of the way. As you write your story or the story of an ancestor, do keep in mind everyone’s right to PRIVACY. Do you have your own check-list to use as you decide on what remains private? If so, please share. What is your go-to resource when evaluating what to keep private versus make public? Maps are so important to our research – they help establish a context we often cannot get from any other resource. I particularly love historical topographic maps, civil war maps and soil survey maps. They have proven value when I’m doing research. One source of invaluable maps is The National Map (USGS). Thanks for being part of our citizen science project. Your hard work and quality edits have led to TNMCorps having an excellent reputation both inside and out of the US Geological Survey. Also, thank you for your patience as we transition to the new web mapping editor. You’ll find much of the same functionality, some improvements, and you will notice a few things you’d like to see changed or improved. We look forward to your feedback and want to let you know that we also have a list of update requests that we hope will be addressed early in FY17, which begins October 1, 2016. Perhaps the biggest change is the way the login/registration works. In order to provide a more secure process for logging in we have to moved to OAuth 2.0. In doing so, we are limited to the number of third party applications that you can log in with, although we hope to add more in the future. Basically it comes down to this….in order to edit you’ll need to register again on the new site. In doing so, it will help a lot if you use your same username so we can tie information from your old account to your new account. If your username changes for whatever reason, please let us know by emailing us at [email protected]. You will need a Google (gmail) or Microsoft based email account. If you don’t know if your email will work or not, just try it using either the Google button or the Microsoft button on the login page of the editor. If your email won’t work using Google or Microsoft and you want to KEEP your email address the same, then open a free account on ArcGIS Online, then login with that information. For you more experienced editors, one of the biggest concerns you might have is that we have not (yet) included your total edits from the previous editor. However, we are still tracking your totals to use for recognition and awards. Also, your roles (Peer Reviewer and/or Advanced Editor) have not been automatically assigned. We are working to update your roles/points as soon as possible. If you use the same username it will help us a lot in tying the old and new accounts together. Many of you also use the history of a point to help you when editing. In combining databases which will ultimately streamline the time it takes for an edit to become available for integration into The National Map and US Topo Maps, we were unable to keep the history. As part of FY17 enhancements, we will be implementing the ability to see the history of any point. Currently you will only be able to see the history of your own points. We have started a list of FAQs relating to the new editor, and look forward to your feedback. If you need further help, we are an email or phone call away. Want to learn more about becoming a USGS Volunteer Map Editor? Check out this article USGS Needs YOU! Help Our National Mapping Efforts ByAdding Your Community’s Landmarks and Buildings. Note: The links have not been verified as all still working. What are your favorite resources for historic maps? What single map made “a difference” to your family history research? Early Bird Registration for NGS Research Trip to SLC ENDS 1 September! 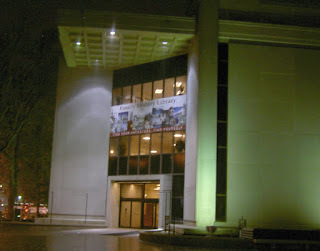 Have you ever visited the Family History Library in Salt Lake City, Utah? If not, consider joining the NGS Research trip there, 12-19 February 2017. There is no place like this particular library. Researchers have access to numerous commercial computer databases, more than two million rolls of microfilm, an immense collection of genealogical books, and outstanding worldwide maps. And, it’s not just research all the time! The trip includes a pizza Party (the Wednesday night) and a closing dinner (on the Saturday and typically held in a period room at The Lion House). Under the guidance of Marie Varrelman Melchiori, retired CG & CGL, and Shirley Langdon Wilcox, CG, FNGS, FVGS, participants will use the genealogical resources at the renowned Family History Library to conduct their personal genealogical research. 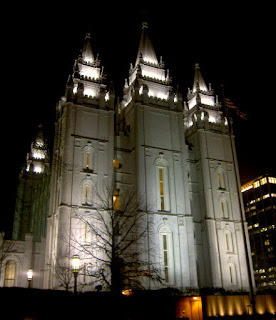 For more information, or to register for the trip, visit http://www.ngsgenealogy.org/cs/conferences_events/research_tips/slc_research_trip/slc_research_trip_general_information. Early bird registration ends 1 September 2016! Remember that the “early bird gets the worm” or in this case a discount of $300 off the published price! Marie and Shirley look forward to guiding you as you conduct research in this incredible library. ARLINGTON, VA, 23 August 2016—The National Genealogical Society (NGS) announces the publication of the newly revised and updated Research in Pennsylvania. This essential guide book introduces family historians to a wealth of historic documentation that can aid their genealogical research. 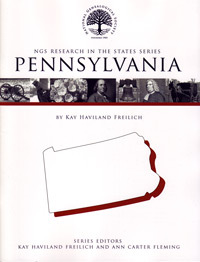 Written by Kay Haviland Freilich, CGSM, CGLSM, FNGS, Research in Pennsylvania, 3rd edition, is part of the NGS Research in the States series and is available for purchase in the NGS online store in both PDF and print versions. Many American families can trace their roots back to early Pennsylvanian immigrants, including the Dutch, Swedes, Finns, Germans, Scots-Irish, Welsh, and African Americans as well as later immigrants from Asia and Slovak countries. New to this edition is information about the Vital Records Law Senate Bill 361 (Act 110), enacted in 2011, that opened Pennsylvania’s older birth and death records to researchers for the first time. The author reviews the age restrictions that apply to those records, the transfer of the currently open records to the State Archives, online access to those open records, and the special option established for state residents. After a concise review of the state’s history and settlement, the book delves into the types of genealogical resources that can be found both in major and lesser known archives, libraries, societies, and federal repositories. Changes in repository holdings are itemized and new repositories have been added. Research in Pennsylvania also covers other research categories, including atlases, gazetteers, and maps; business, probate, and court records; colonial enumerations and state and federal censuses; city and county directories; ethnic, religious, and military records; and much more. Additional religious organizations are included, and web sites and contact information have been updated. Kay Haviland Freilich is a 2012 NGS Fellow and co-author of Genealogy and the Law: A Guide to Legal Sources for the Family Historian. Winner of the 2009 NGS Family History Writing Contest, she is a former president and trustee of the Board for Certification of Genealogists, a former officer and board member of the Genealogical Society of Pennsylvania, and a frequent speaker on Pennsylvania topics. The Research in the States series editor Barbara Vines Little, CG, FNGS, FVGS, is a former NGS president and editor of the Magazine of Virginia Genealogy. Other volumes in the series include Arkansas, California, Colorado, Florida, Georgia, Illinois, Indiana, Kentucky, Maryland, Michigan, Missouri, Nebraska, New Jersey, North Carolina, Ohio, Oklahoma, Oregon, South Carolina, Tennessee, Texas, Virginia, West Virginia, and Research in New York City, Long Island, and Westchester County. Additional states guides are planned. Libraries Are Helping Patrons Digitize! Are You Aware of The Mini Page Archive?